Both cats have been kept strictly indoors their entire life, and will both turn 11 this year in mid September. They have lived in a quiet house without other pets or children. Both Chloe and Maple can be a little timid around new guests, and especially noisy kids. Unfortunately, life changes have made it impossible to keep the elderly kitties through their senior years. I am hoping to re-home the middle-aged ladies to another quiet home where they can get the attention that they deserve. 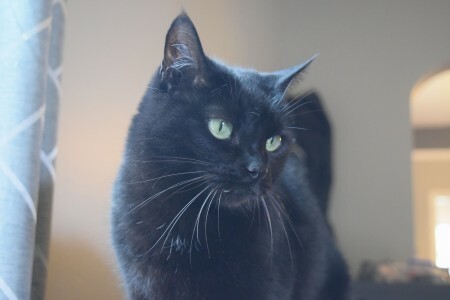 Chloe is an all black short hair cat. She is the direct descendent of the leopard, and this she proves when she attacks a red dot from a laser pointer with such ferocity, that it makes even radio shack timid. As a typical cat, she prefers to get her attention on her terms, but this doesn’t meant that she doesn’t like to snuggle. 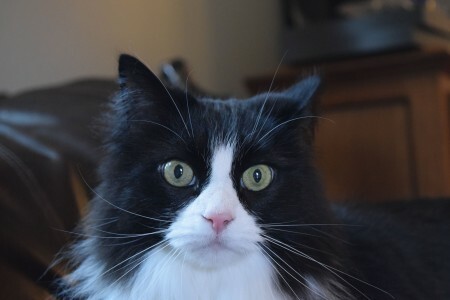 Maple is a medium hair black and white cat. She is the direct result of domestication of felines. While she may not have the quickest cat-like reflexes, or natural instinct of a cold blooded killer; she makes up for her shortcomings by wanting to be loved by her people. She adores attention. She is a little more timid than Chloe, but she is the first to want attention after the dust has settled.